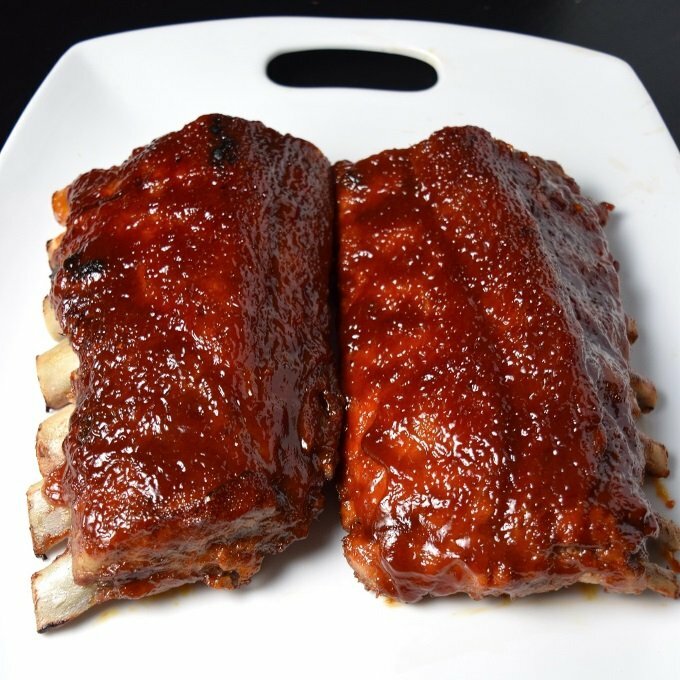 If you want to learn how to make BBQ ribs in the oven, you will love my simple two-step process: First bake the ribs in the oven till tender, then broil the sauce till it caramelizes. These are the best oven baked ribs you will ever have. Tis the season. Grilling tools are being replaced with snow shovels and the hammock is being traded in for the overstuffed chair in front of the fireplace. However, that does not mean you still can’t enjoy the spoils of the grilling season, indoors. During the cold winter months you can still savor finger-licking BBQ ribs without dashing through the snow to your favorite smoker. You can make great BBQ ribs in the oven. Making ribs in your oven can quickly lead to disaster for many home cooks. Ribs by nature are tough pieces of meat. It is only through a long, slow, cooking process that they begin to melt into that tender summer treat we crave to slather with succulent sauces. Inexperienced home cooks will find that the ribs have come up to a safe serving temperature and take them out of the oven well before they are actually done. 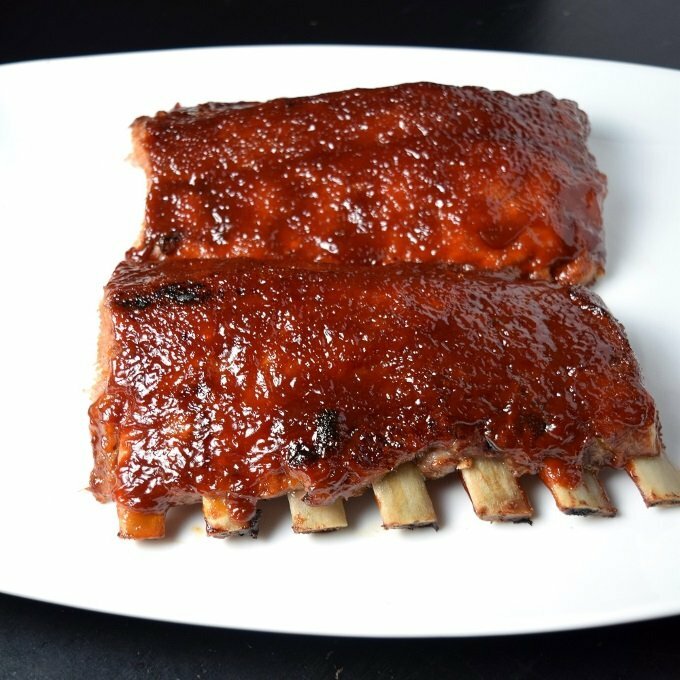 Unlike many pieces of meat, just because the ribs have come to the proper temperature does not actually mean they are done cooking. Instead, they need to continue to cook so the collagen (connective tissue) breaks down, rendering a much more tender piece of meat. There is a household phrase that continues to be a misnomer of ideal BBQ ribs: “Fall of the bone.” You do not want “Fall off the bone” ribs. These have been overcooked and feature a mushy texture – more reminiscent of a lazy crock-pot cook than a seasoned pit-master. Properly cooked rib meat should threaten to crack when held up with tongs, and the bones should be able to be pulled away fairly cleanly with a firm twist. However, the meat should not come separated from the bone without assistance and should not lend itself to be described as “falling off the bone.” A properly cooked rib should be soft and tender but yet still have a slight chew to the meat, much like a very tender steak. To begin making the best BBQ ribs in your oven start by removing the membrane from under the ribs. This can be tricky for some, but it is pretty easy with this trick. Simply slide a spoon between the membrane and a bone to loosen it up, then I use a napkin for grip and pull it off the slab in one strip. The napkin prevents your fingers from slipping off. Once this is done the meat can be seasoned with your favorite dry rub or simply some salt, then they are ready to cook in the oven. When cooking ribs outdoors I adhere to strict traditionalism. I use a smoker (affiliate link) and I do not take shortcuts in their preparation. I use a very common slow and slow ‘3-2-1 rib method‘, figuring if it is good enough for competition pit-masters, it is the method I should get acquainted with. However, when I make BBQ ribs the oven I don’t prefer utilizing the 3-2-1 method. My favorite oven rib recipe is a simple two-step process: First bake the ribs at 350 degrees for two hours until tender, then broil the sauce till it caramelizes. The ribs are wrapped while baking in the oven. 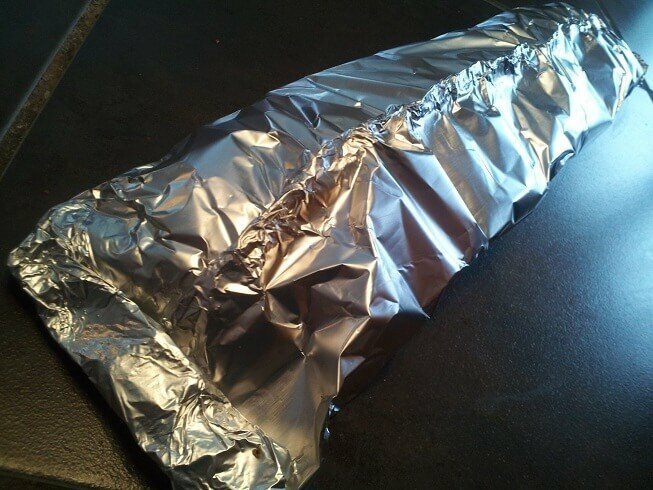 Wrapping the ribs in foil helps speed the cooking process while ensuring they are melt-in-your-mouth tender. This is also referred to as the Texas Crutch. However, after two hours of cooking, we will unwrap the ribs to apply sauce. When the ribs are finished cooking we are going to caramelize the BBQ sauce under the broiler until they are delectably sticky. You will place the ribs under the broiler lacquer with additional sauce every few minutes until a hot sticky bark is formed. This will take 30-60 minutes total, depending on how thick you want the sauce. Broiling the ribs coated in sauce is the secret to this recipe. Broiling BBQ sauce will quickly cause it to boil, releasing moisture and causing it to thicken into a finger-lickingly delicious sticky jam. Not only will this thicker sauce adhere to the meat better, the flavor becomes more concentrated as well. Try this recipe with my homemade BBQ sauce! BBQ sauce is high in sugar so carefully watch the ribs under the broiler as they can burn easily. They should never be left under the broiler for more than a few minutes at a time without being moved around or adding additional sauce or you will be awoken to your mistake by smoke alarms. If you are looking for something to serve this with, you can’t go wrong with my hand-cut French fries recipe. This is the perfect side dish for BBQ ribs because you won’t need the oven for the French fries, just the stove top. I’ve made a lot of different French fry recipes and I promise you will be impressed with this one! Cooking BBQ ribs in the oven can be just as delicious as outdoors and not very hard at all. These ribs are tender, sticky and delicious! Your friends and family won't be able to get enough of them! Remove the membrane from under the ribs using a spoon to slide between the membrane and a bone to loosen it up and then pull off the membrane with a napkin in your hand for grip. Once this is done the meat can be seasoned with your favorite dry rub or simply some salt. Wrap the ribs in foil, place on a baking sheet and set in the oven for two hours. After two hours, unwrap ribs, discard the juice and foil. Flip ribs upside down and slather the bottom generously with BBQ sauce. Turn on the broiler and set BBQ ribs underneath until the sauce has thickened. Once lacquered, let the ribs rest for 15 minutes prior to slicing and serving. IF YOU LIKED THIS RECIPE check out my 3-2-1 Ribs Method too. This recipe was originally published on FoxValleyFoodie.com December 9, 2012. If you enjoyed reading how to make BBQ ribs in the oven then you should probably like me on Facebook and follow me on Pinterest too. That’s what I would do at least, because if you don’t get to know me but you still use my recipe it is kind of like taking candy from a stranger, and your mom taught you not to do that. Don’t disobey your mom, subscribe to Fox Valley Foodie today. I live in Italy and was missing the states, just followed your recipe and they turned out excellent!! !Thank you! That is fantastic to hear! Thank you so much for sharing. This is one of my favorite recipes, period! Funny how you phrased trying to cook ribs in the oven can “quickly lead to disaster for many home cooks.” And in my case… many times! I found your directions very clear and easy to follow.. After this tutorial, even my kids gave me compliments when before I think they dreaded me making them. Thank you so much for the recipe and tutorial because now my ribs are “awesome” ribs for my family. I’m glad to hear that! Congrats! These look divine, and I will give them a try, however, standing over them in the broiler for up to an hour doesn’t appeal to me. At all. You will love the recipe! Though don’t worry, if you don’t want to mess with the broiler you can just slather sauce over them and be done. Though, even placing one lacquering under the broiler for a few minutes will improve your results. Tried your recipie and my ribs shrank significantly… Almost to the point where there was no meat. VERY Disapointed in this recipie!!! Rib lollipops! Oh my! 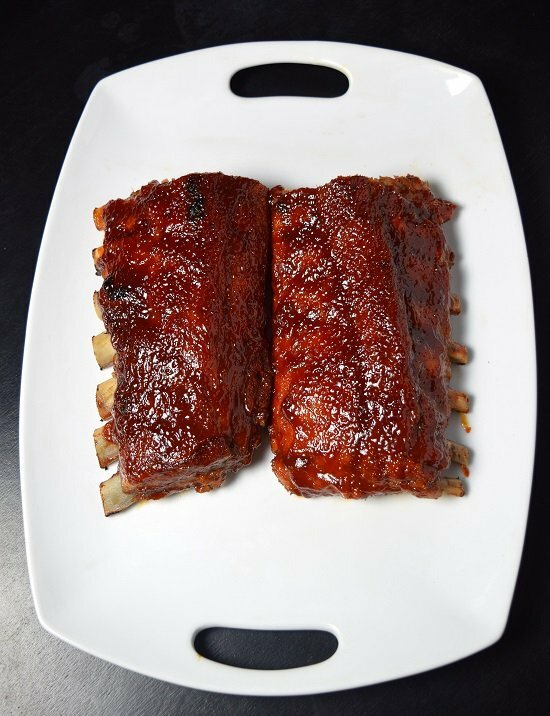 Were you specifically using pork baby back ribs (pork loin ribs)? It sounds like an issue with the cut of meat or how it was trimmed. Myself and friends have cooked this recipe too many times to remember and you can see in the pictures how they turn out, I’d be happy to help you troubleshoot if needed. Its the meat, the ribs itself Depends on that also. As you can see in the comments they turned out great. So did mine. Ive made them a few times. Check to make sure its not beef those can be fatty and shrink to nothing. Pork is really what u should use. Beef ribs are mostly all fat. Just want to start out by saying THANK YOU for posting this recipe! These are by far the bestribs I have ever had or made! They are now the only way I will make ribs and my family goes crazy when I make them. So again thank you so much! Rain was in the forecast for Memorial Day here in NYC. So we moved the party inside, and I used this recipe. Best ribs I’ve ever had! Thanks for sharing. Fantastic! Picking up a great recipe is worth a little rain! I just made this rib method. I used spare ribs and had to cook a little longer due to the size. Wow are they tender and tasty. Wasn’t over cooked and had a killer coating on them. I’ll be using this method from now on when I cook my ribs indoors. I’m glad to hear it worked so well for you too! Best rib recipe I have ever tried! We no longer cook our ribs any other way! Thank you for sharing this recipe. Same here. If I am making ribs indoors, this is the only recipe I’ll ever use! I am from Alabama and live in Australia. I found your recipe about 18 months ago when we hosted a 4th of July down under and it has become my go to for ribs. I even messed up the temp conversion once and they still tasted fabulous! I’m glad you had such success with it too! I tried this recipe last night and I will say that this was one of the best rack of ribs that I have ever had, and my family loved them! I look forward to trying more of your recipes! Tried these tonight and I have to say, they’re AMAZING!!! It was a bit time consuming at the end with the glazing but totally worth it! I will definitely be making these again! Thank you!!! Do you drain the juice before broiling the ribs? Then leave then in the foil? When you take them out of the foil the juice can be discarded. Double yum! We have decided not to use our grill so much so I found your recipe. My husband is from Southern Indiana and bbq ribs are a basic eat down there! Made these and I actually got compliments! Trying another batch today! Got any good recipes in oven for chicken wings? Not a buffalo person myself but smokey ones would be just right! Thanks! Nice and easy recipe for some great rib lovers! What temperature do you broil it on? I typically set it on high, though that will burn fastest so you need to watch it closely. However, you can use whatever broiling setting you are most comfortable with. Thank you for the spoon & paper towel tip! Thats the first time i’ve eve been able to get the membrane off ribs without it turning into a swear- fest 🙂 . I did half bbq & half plumb, i think i died & went to rib heaven. Thanks so much for a sensible recipe that yields great results. I’ve been burned by the “low and slow” methods that turn out mushy, almost inedible ribs. Great job! Yeah, I’ve been burned by those too, so I get it. I used 2 racks of pork back ribs didn’t change time or temp and when it was time to flip to sauce them they kinda fell apart. So next time i cooked them upside down for 2 hours, opened foil, removed juices, sauced bottom, broiled 5 minutes, flipped ribs with foil right side up, removed foil, slathered the bbq sauce 3x’s 5 min. each time. They were easier to handle and still turned out as delicious as b4! 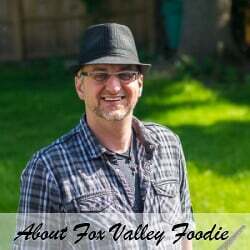 Thank you Fox Valley Foodie!! I love the process! I used the good ol’ classic Sweet Baby Rays on my ribs and it was a hit with the fam bam. Thanks for sharing your method.